There were a lot of cooks in the kitchen—and it was perfect. 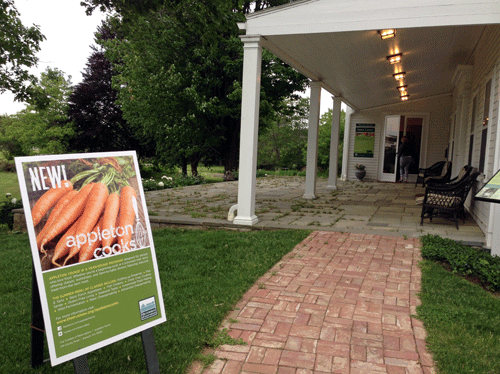 We recently attended a terrific class given by Carolyn Grieco of Farm Cooking With Carolyn at the new Appleton Farms demonstration kitchen. Second, there’s a new café offering salads, sandwiches, desserts, and beverages from 11:00 to 2:00 Wednesdays through Saturday. Third, on select Friday nights in July and August, there will be family farm dinners with pizza from the group’s just-built earth oven. 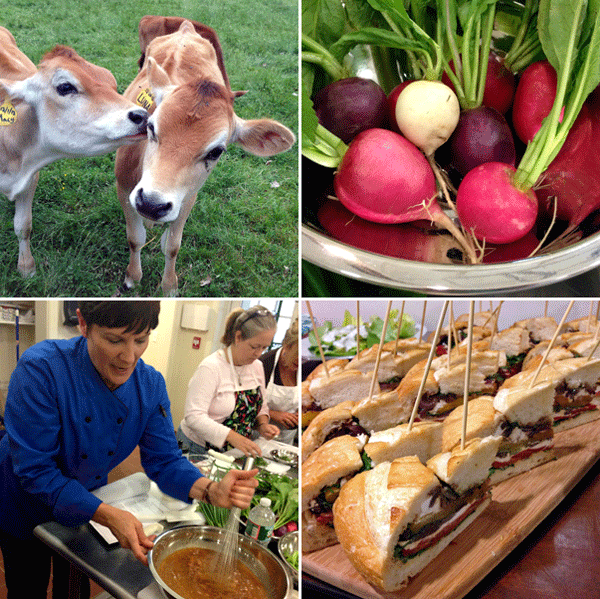 Finally, the Appleton Cooks series of classes and workshops has 30 events scheduled in June, July, and August with classes on cheesemaking, pasta making, gluten-free living, seasonal tapas, and much more. Prices range from $25 to $85 for non-Trustee members. We thoroughly enjoyed the class we attended, coming away with food profile insights, great recipes, and new friends. We gathered in the kitchen, which was set up with workstations and ingredients, most from the farm. Carolyn went over the menu and then we split into groups of three or four to prepare the dishes. The meal consisted of grilled zucchini hummus with homemade pita chips, spicy peanut noodles with snap peas, green goddess chicken salad with cucumber and avocado, a veggie-stuffed picnic loaf, and skillet strawberry shortcake. As we collaborated to prepare the meal, Carolyn demonstrated everything from knife skills to “temping” the poached chicken, arranging the composed salad, and tray rotation to get the pita chips properly crisped. She was full of energy and great tips for both seasoned cooks and new ones. She was happy to accommodate dietary concerns (a non-spice lover got her own chips without cayenne, and we prepared a salad without chicken for the vegetarian in the group). While meal components were cooking/cooling, we took a short walk to the kitchen garden to pick herbs that we combined with farm butter. We spread it on baguette slices and ate it with freshly-picked radishes while Carolyn showed us the picnic loaf technique. These have to sit overnight, so she brought some already prepared for our meal. And what a meal. Everything was incredibly fresh and flavorful. The green goddess dressing was amazing with the chicken, the blanched snap peas were the perfect contrast to the spicy noodles, the picnic loaf was full of balsamic-marinated vegetables and goat cheese, and the dessert was warm and luscious. We are thrilled to see this 375-year old farm embracing the North Shore’s thirst for local food, farm-to-table, and new food experiences. See you on the farm!